One of the best hikes ever... We had a lot fun, not only in putting up the tents and feeling away from civilization, but also in the hiking we did. We set our tents in a kind of sandy area, which offered protection from the strong winds of the Blacksea. 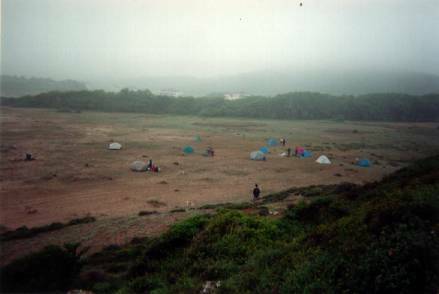 There were about five tents of the hiking club, which could take only about two people, and tents of other people. But the most envied one was the huge tent which could take 5 people but in which, only Yalın and Onur stayed. I am sure they were very comfortable in Mr. Carter's tent... (By the way, Yalın told me that he personally wanted to thank Mr. Carter) Anyway, it was quite enjoyable to set your own home away from skyscrapers. After setting up the camp and eating our lunch, we set out to explore the area. We hiked by the great waves of the Blacksea. Some of us got wet while trying to walk more closely to the sea. 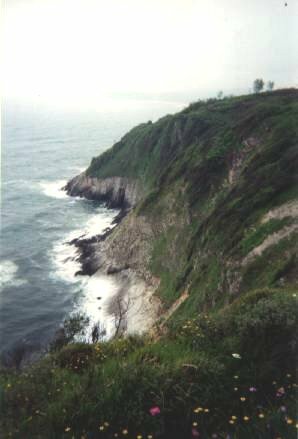 Then we came by a steep 50 meter hill and since there was no other way by the coast, we climbed. We followed some paths and came by a raised rocky area by the coast. We were not only hearing the magnificent sound of waves but also we could watch them hit the rock and fly about 10 meters high. It was a magnificent view. In order to have a better look at the fantastic view of the waves crushing against the rocks, most of us got closer to the sea. There was a spot just by the sea that no water splashed at for the first 20 minutes of our presence. 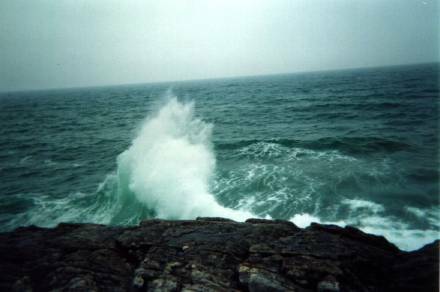 However, later, a giant wave came and all the rocks up to 10 meters away from the sea got wet along with about 15 hikers. After this fun but "cold" experience, our advisors decided that we ought to return back to the camp. However, upon discussing that we wanted to go on exploring the coast with the advisors, we (8 hikers, including myself although I was wet) were allowed to continue in the guidance of Ms. Moore. So off we went. We hiked for about 4 hours after getting wet. Since it was quite hot, our clothes dried pretty quickly. We continued along the path which went just beside the sea. There was not much to be seen except the magnificent view of the Blacksea. When the path finally came to an end and we could not advance further because of the branches all around, we turned back. This was not the end of the hike however, since we decided to return to the spot where the rocks met the giant waves and try to climb the rock, hiking just beside the angry waves. Again, our path was blocked by thick branches and thorns. While coming down from this place to finally head back to the camp, an interesting and quite funny incident took place. Yalın was just in front of me, and Sinan behind. We were walking on a 40 cm wide path. There were bushes on our left and the sea on the right. We were advancing cautiously, at least I was. Yalın stepped on some soil which I thought was just about to slide of the hill into the sea. I was cautious not to step on the same spot so that I would not go flying into the sea. Had Sinan been close to me, I would have warned him but he was not. So he came and stepped on this unstable soil and he slid since that path was not designed to hold his weight. He held on to some branches and bushes and saved himself but his face was thorn in several places. So we didn't have casualties, but had to look at Sinan's bruised face for a few days. At night, we lighted a fire and singed songs, cooked bananas and sucuk on the fire. We had a very good time until the rain started. Then we ran to our tents, put our backpacks and stuff into our tents and gathered around the fire to hear some scary stories before going to bed (actually, into our sleeping bags). Finally we went to bed. We understood that we were quite unlucky that we had spilled the nozzles: Two dogs came barking around our tent, ate the food and nearly ran into our tent for more. By the way, I knew that it was a full moon on that night and this was an ideal mood to tell scary stories. Thinking that Sinan could be angry at me and destroy the tent on us, I decided to keep my thought to myself. I was only able to sleep after "the dogs" had gone to sleep. In the morning, I was awakened by the sound of the waves and the singing of the birds. I decided to get up early, hoping that I could have a short walk. I was out of the boring air of the tent in seconds and saw that Yalın was up too. We chatted for sometime and I told him out the terrible night, and the full moon. Later I went to get some water, which was needed for both cooking and washing, from a nearby place. After eating sausage sandwiches for breakfast, we put down our tents and packed our backpacks. The hike was over, except for the sleepy return home on the bus.